Prepared by Ian Smith, 27th April 2011. 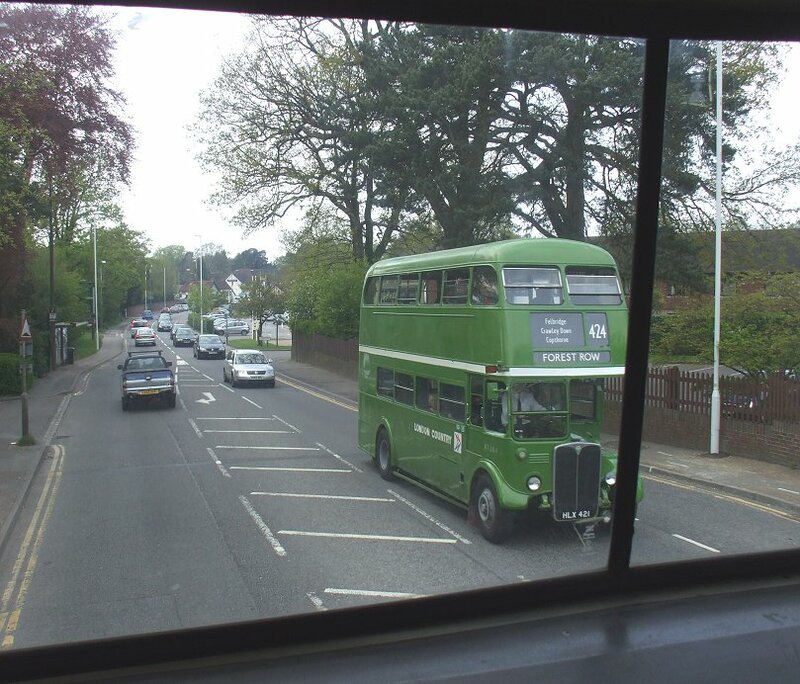 I climbed aboard DMS1868 and went upstairs, to get a grand front view from the big front windows. 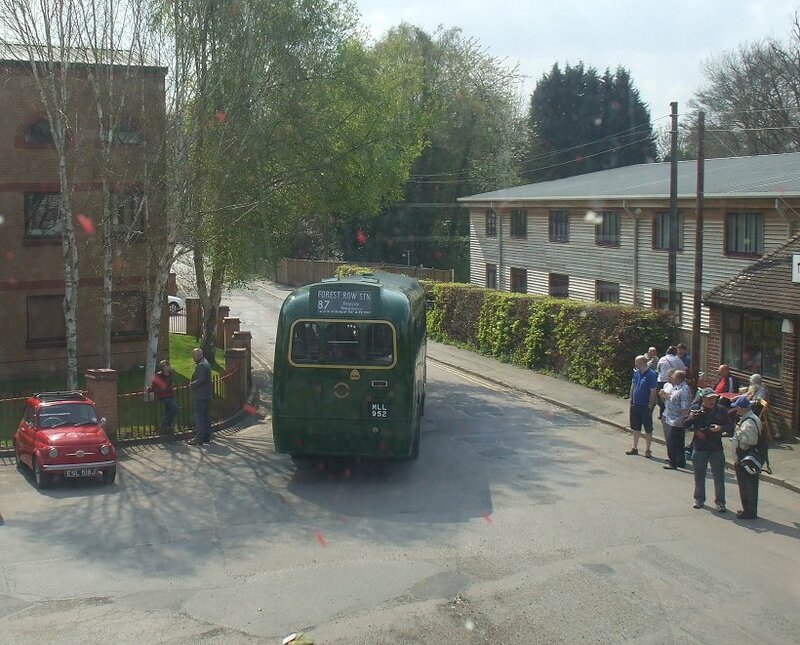 We followed RF315 out of the station yard and up towards the town. 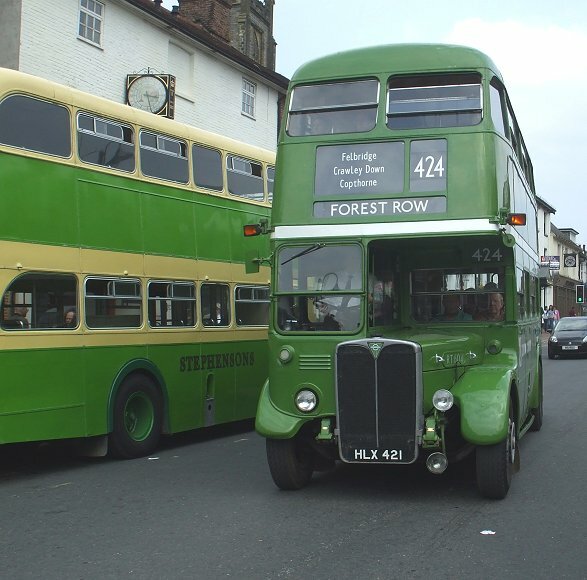 We turned right onto the main road to reach the centre of Forst Row. 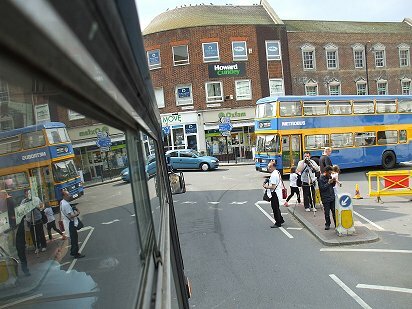 XF3 came the other way, but my camera insisted on focussing on the paint flecks on the windows instead of on the oncoming bus, so all I captured was a blur with flecks on! I was more successful with RM1397, which we passed in the middle of Forest Row. 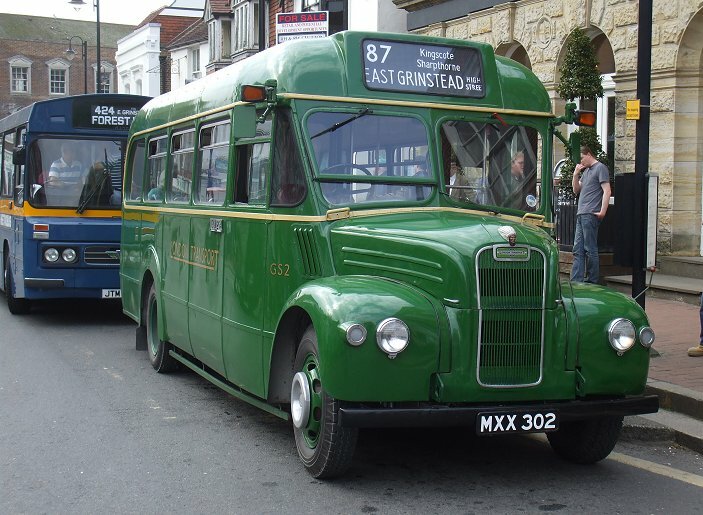 I had the same problem when I reached East Grinstead, after the long climb up past Ashurst Wood. So I jumped ship and waited for the next 424. 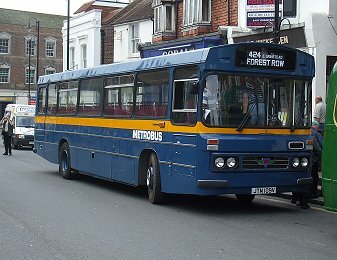 Across the road was RF600, which had arrived on a 494 duty, followed by SC390 off the 87. They moved on, and their place on The Crown stop was taken by RT604, heading east once more on the 424. 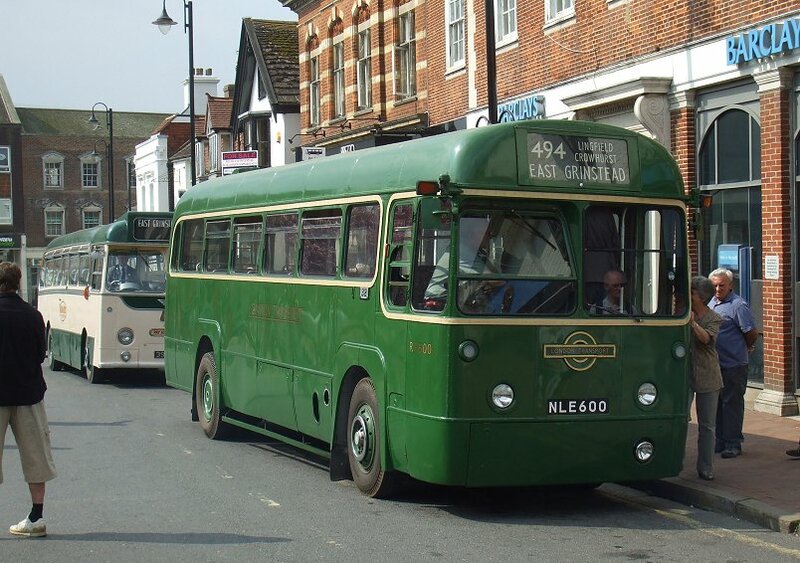 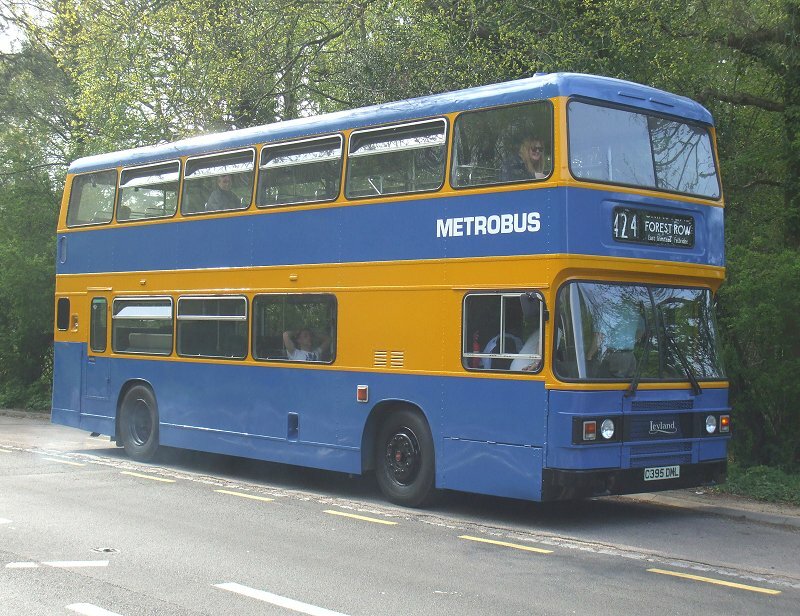 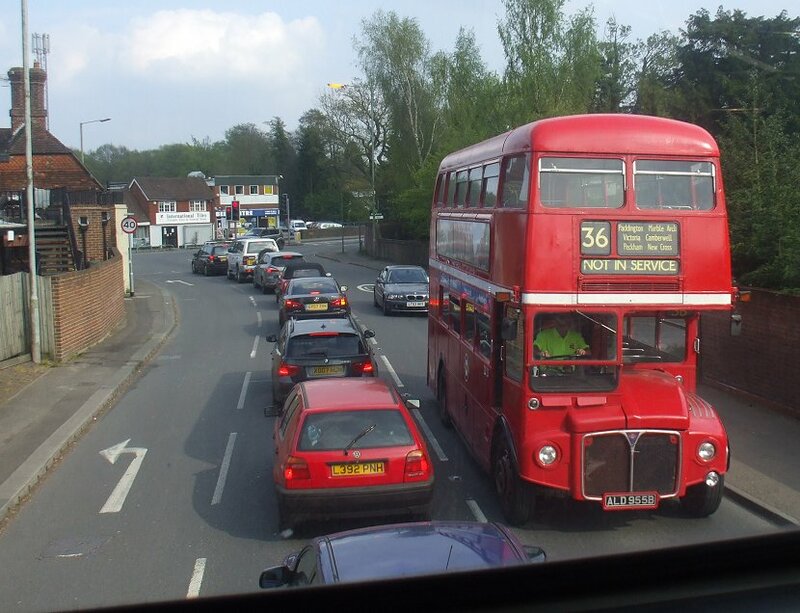 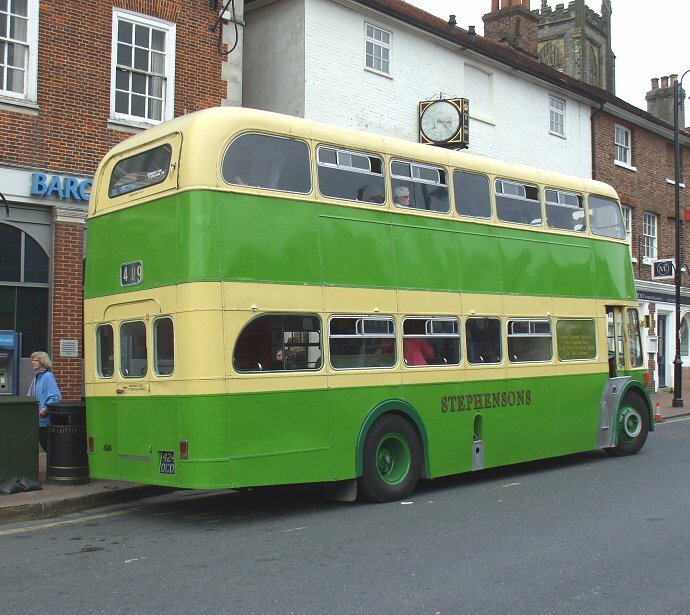 The next arrival on the 424 was the Duple-bodied AEC Reliance, Metrobus No109. I climbed the three steps to the high-floor interior, and took an offside seat. 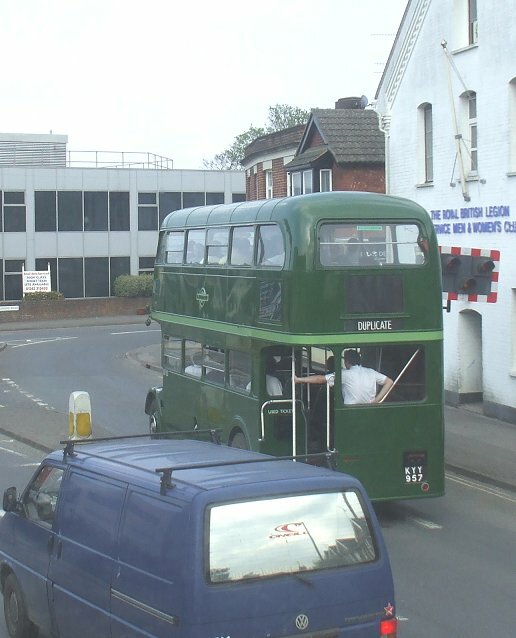 Olympian 395 appeared, coming the other way. 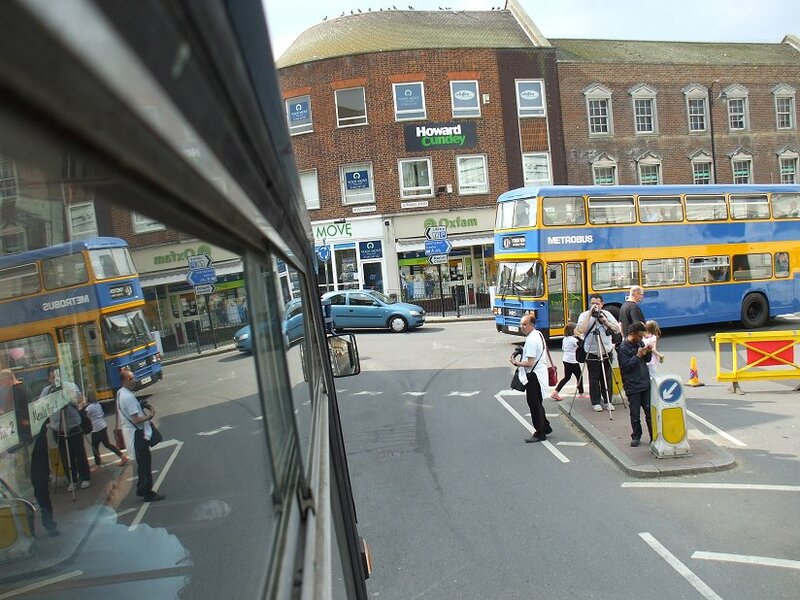 One advantage of a compact camera is that you can operate it outside of a sliding window! 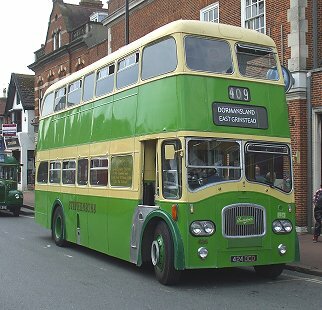 After the silky purr of Reliance SC390 the throaty roar of 109, thirty years its junior, was something of a surprise. 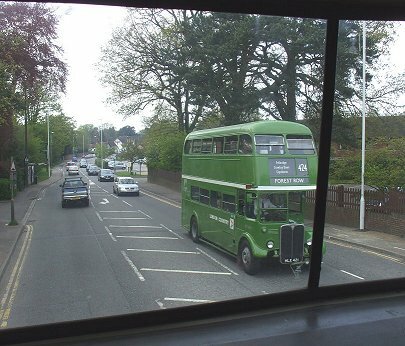 We roared off down to East Grinstead station, then climbed up to cross the bridges over the railway lines (current and abandoned), and headed west along the A22 for Felbridge. We forked left, then left again onto the road to Crawley Down. 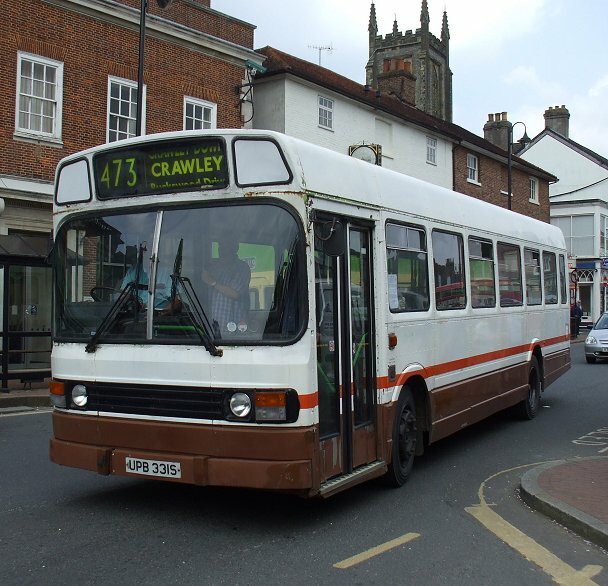 We twisted down to cross the Felbridge Water, and up again into outer suburban Crawley Down. 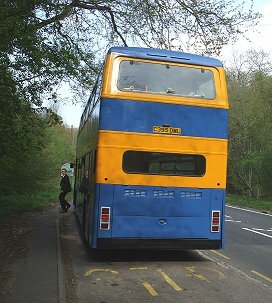 A right fork along Sandy Lane took us to join the Turners Hill to Copthorne Road. We followed that north to The Dukes Head, where we crossed over the A264 to continue forwards to Snow Hill. 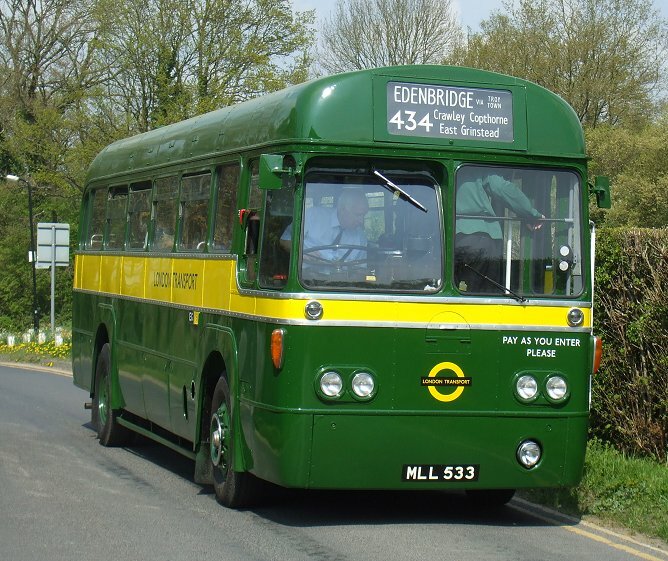 There we turned right, soon rejoining the A264 for the return to Felbridge. We passed through the junction with the A22, then turned off right into the Imberhorne Estate. A left turn took us through the estate to cross the railway just outside the station. 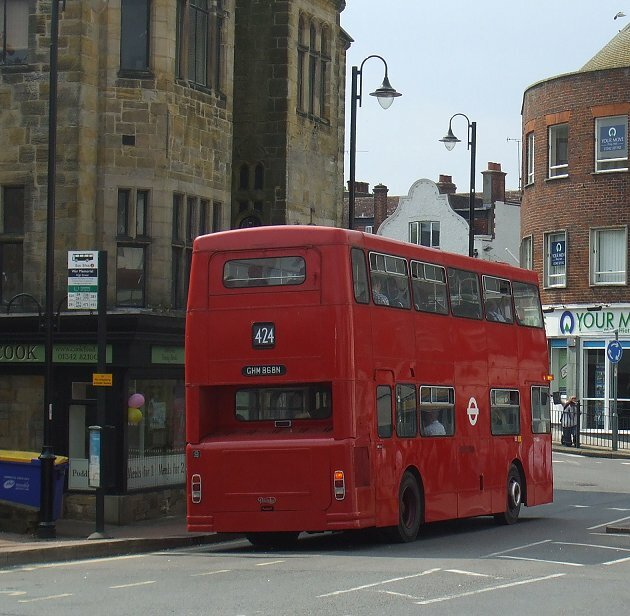 The one-way system then sent us on into East Grinstead, where I alighted at The Crown. 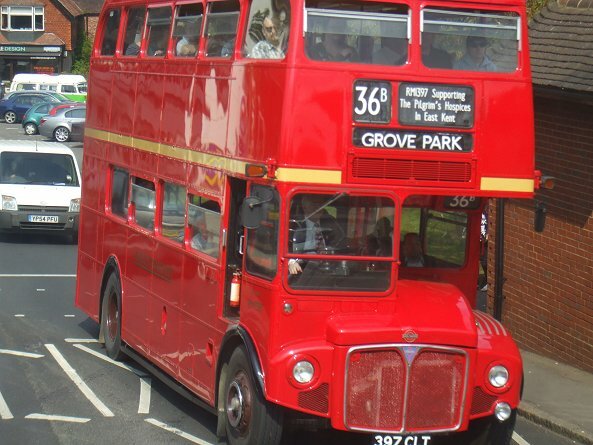 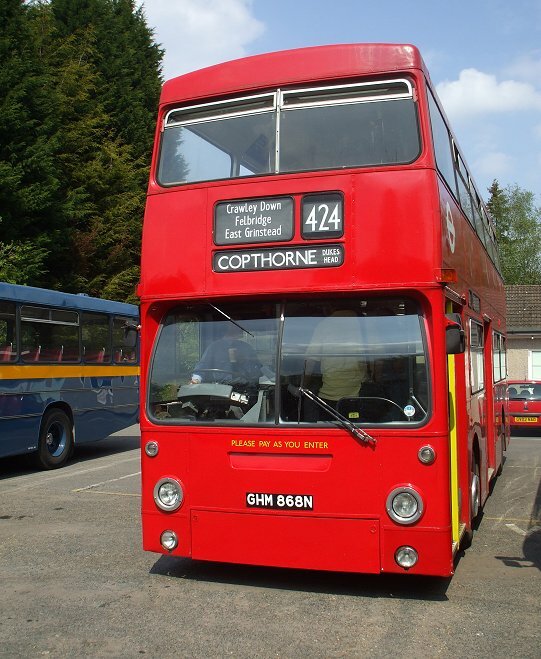 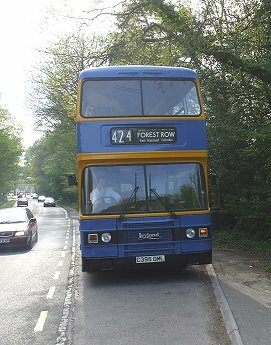 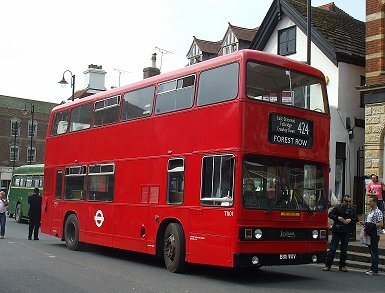 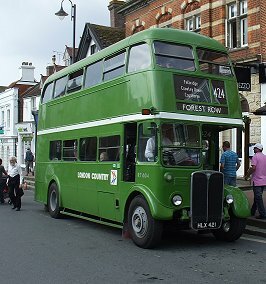 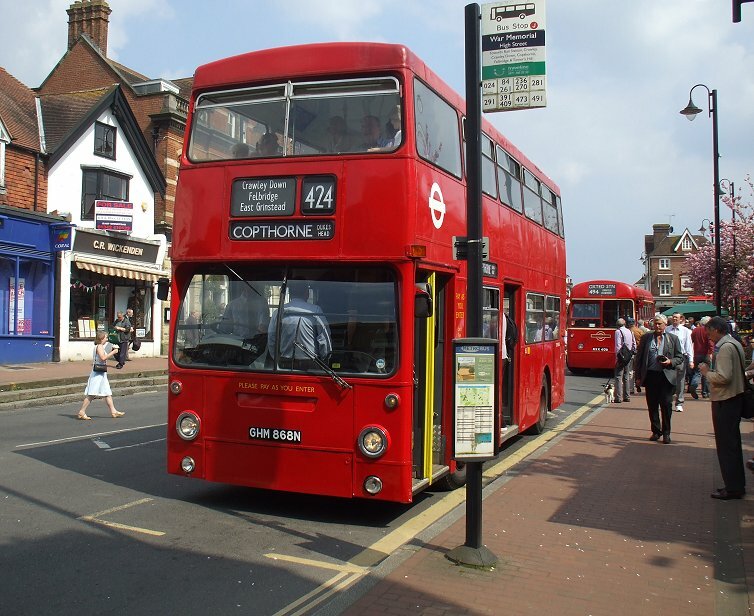 Queen Mary 424, alias LS4, came through eastwards on the 409 from Dormansland to Forest Row. I was tempted to go for a ride, but I have previously been on the bus and guessed that Olympian 395 would soon be back. 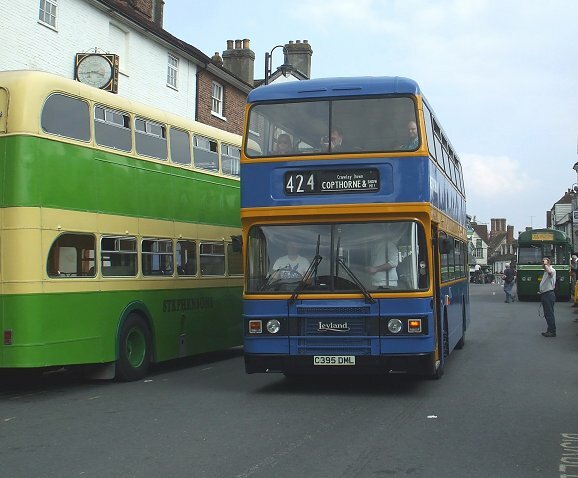 Now there was a brief red interlude: RM1397 came bustling along the High Street with a 409 bound for Dormansland, followed by RF429 which had come up from Forest Row (despite what it said on the blind). 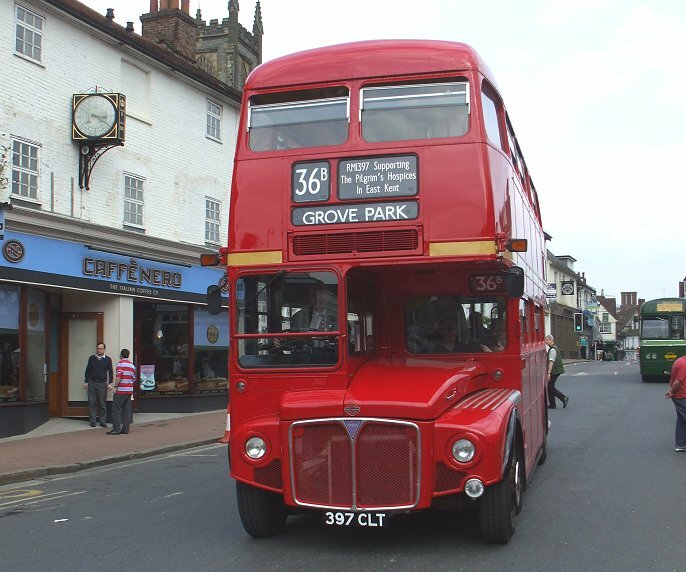 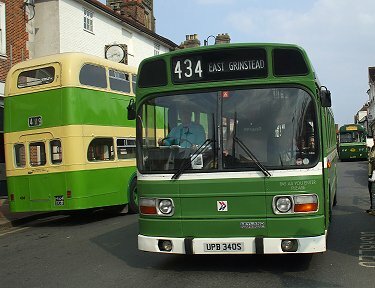 A pair of Leyland Nationals came through: SNB331 on the last through 473 to Crawley, and SNB340 on a 434 from Edenbridge. Two more 424s came through, in opposite directions: RT604 heading for Copthorne (despite the blind), and T1101 for Forest Row. 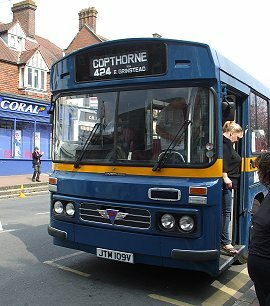 At length Olympian 395 appeared on a westbound 424. I found a seat upstairs at the front, and we headed north-west. 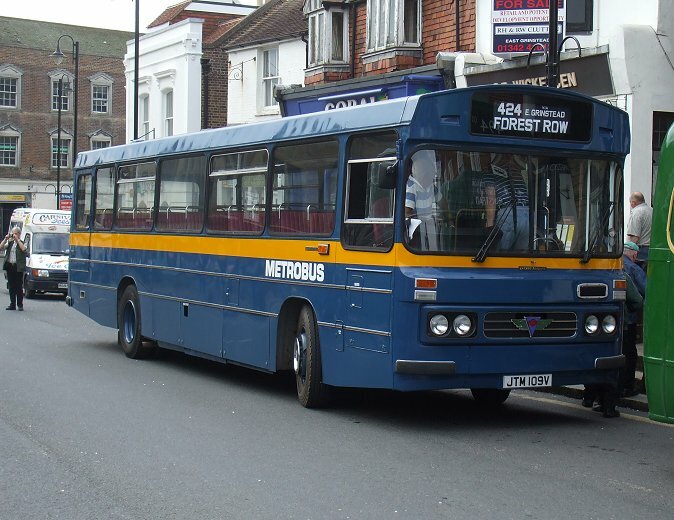 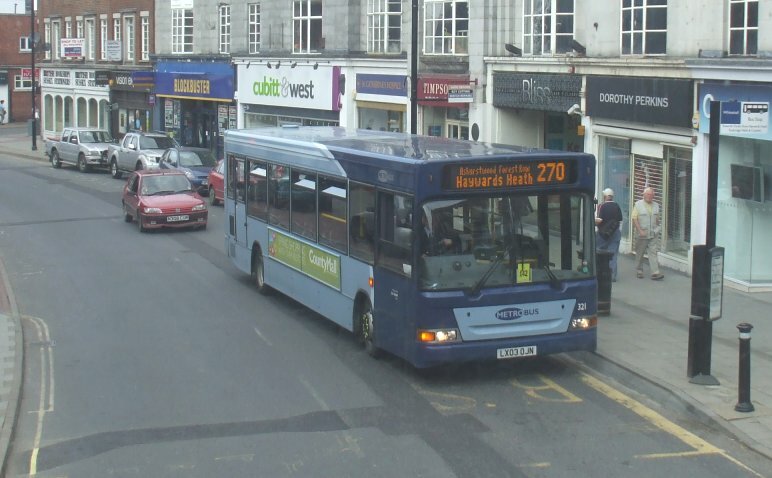 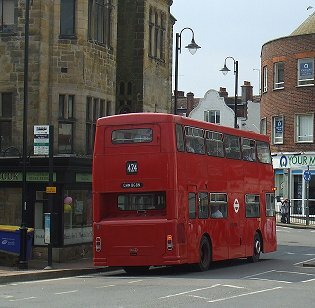 Just round the corner we found Metrobus Dart SLF 321 on the 270 to Haywards Heath. We went on, calling at the station, then heading for Felbridge. RT604 hurried past heading for Forest Row once more. 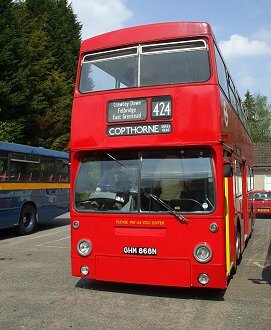 We forked left twice at Felbridge, to follow the route through Crawley Down to Copthorne, not quite catching up a service bus as we approached the Dukes Head. There we turned right at the roundabout, neglecting Snow Hill, and looked for a layby for the benefit of the clutch of photographers aboard. One was located on the way to Felbridge, and we pulled in for a brief stop. 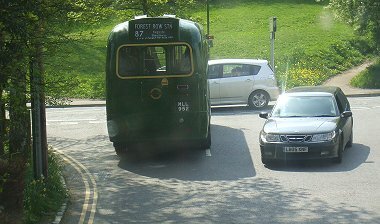 On our way back into East Grinstead via Imberhorne we met RM1955 heading home, then RT3228, which swept round the one-way system ahead of us. 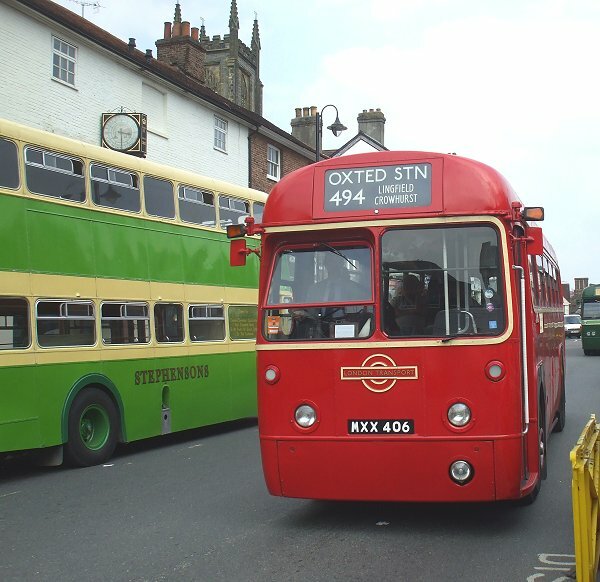 Part Six: 409s and more.